3-D TV is more like looking through a window than watching an actual TV. Of course, 3-D gaming takes that realistic experience to a whole new level. If there turns out to be a killer app for the new 3-D technology, I wouldn't be surprised if it ends up being gaming even if BluRay 3-D gathers all of the attention. This is part three of a series of posts on 3-D for my Media PC. You can start at part one here. 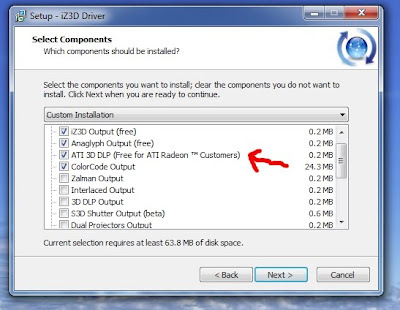 I use an embedded graphics solution on my Media PC's motherboard (ATI's Radeon HD 4200). Clearly this is not an ideal solution for playing GPU intensive games. However, it is more than adequate for typical Media PC applications (and is both cost effective and power efficient). Surprisingly though, the HD 4200 is also capable of playing 3-D games (at least good enough to give you an idea of what 3-D gaming is like). Any seriously gamers will want to upgrade to a discrete graphics card, but at least you can try it out first! So which games can you try in 3d? Nvidia has an impressive list of them by quality here. To get started, I just installed Steam and looked under demos for a free one that was in Nvidia's list. ATI supports 3-D gaming through the use of 3rd party software from a company called IZ3D. This software is free for ATI Radeon users, but I've also read that it can work for Nvidia users as well (I haven't verified this though). I'm currently using the beta drivers which you can find here. Note: Here is an alternative to IZ3d called DDD Tridef that I might explore later. 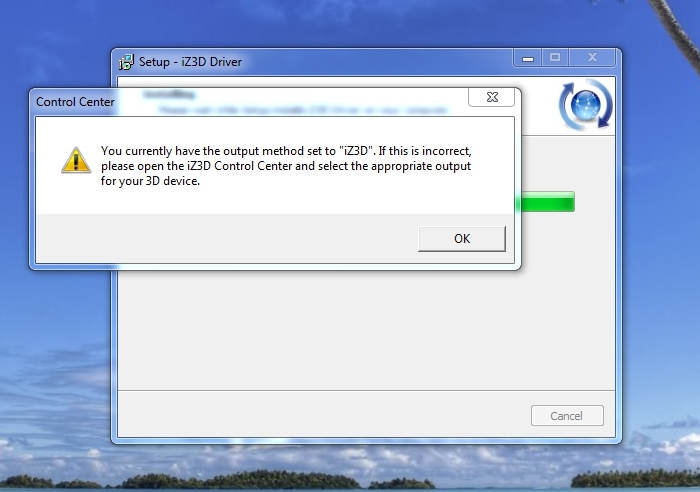 IZ3D's drivers support DirectX9 (and it looks like they are working on DirectX10). I'm no gamer, but I figure this might limit which games you can play in 3-D (Given that DirectX11 is the latest). In any case, it is still possible to use some older games while the 3-D driver software plays catch-up with the gaming industry. Click on either image (or both) to see that you have 3-D working. Of course, this image looks fuzzy because it is meant to be viewed with 3-D glasses. 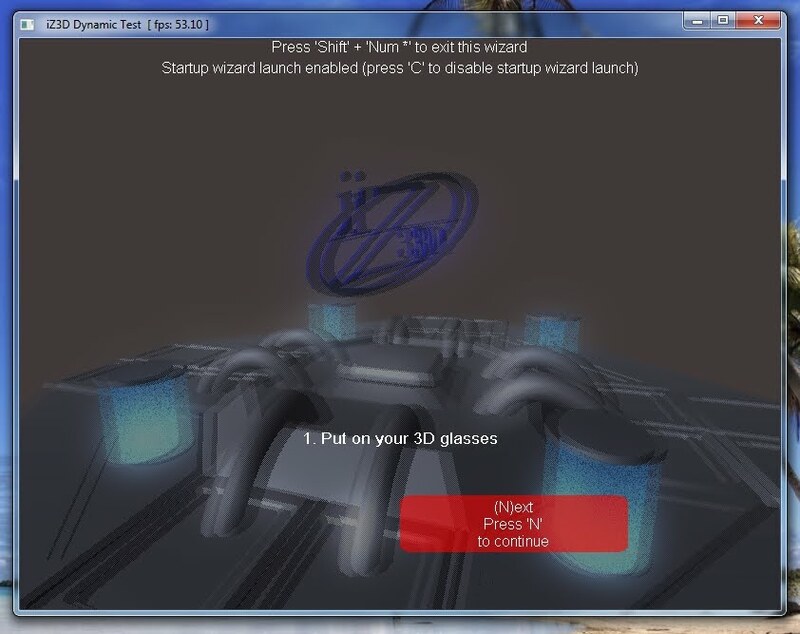 One you launch a game that is compatible with the IZ3D drivers, you will see a text overlay on the initial gaming screen. It will instruct you to put on your 3-D glasses and press 'N' to continue (in RED). 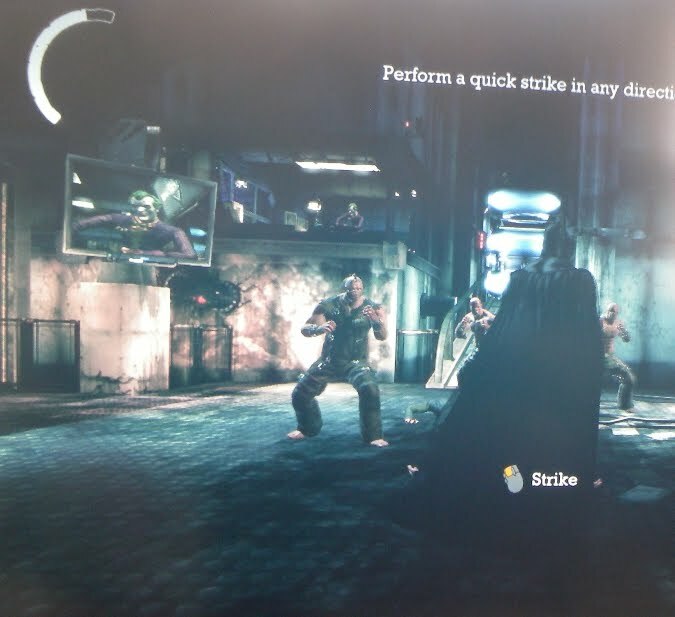 Tip #1: This overlay is from the IZ3D driver, not the game (so it may look strange or be out of context). Tip #2: To make the overlay screen go away, press "Shift NumLock and "*" at the same time. You must use the "*" that is on the keypad, not the one above your 8 key. 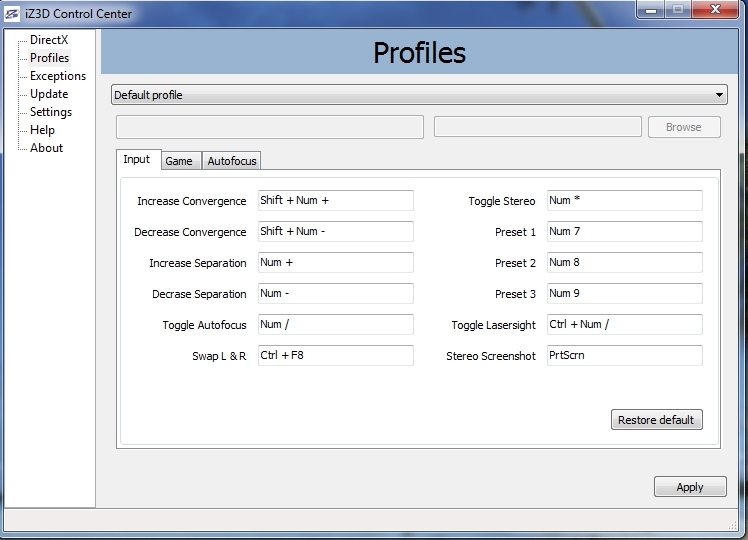 However, before you make the overlay go away, you can explore the wizard to help you configure the 3-D effect. 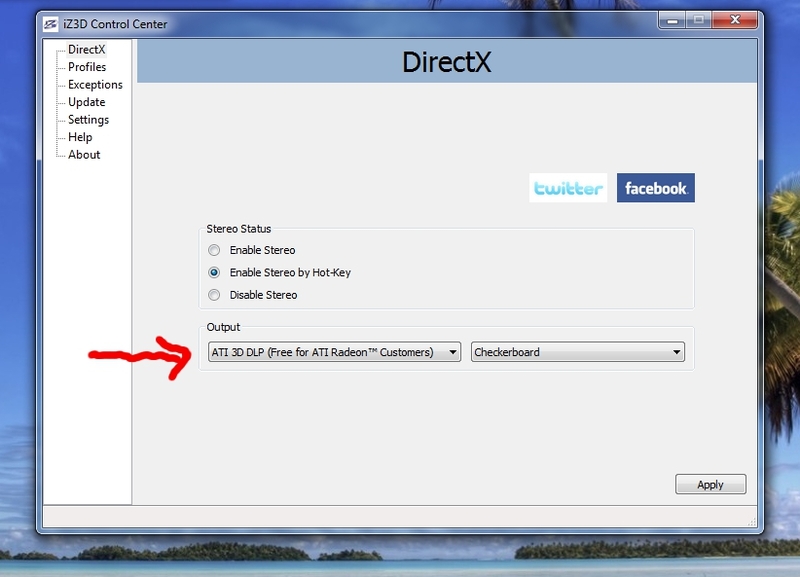 Tip #3: To actually enable 3-D you must press NumLock and "*" at the same time. This will actually toggle between 3-D and 2-D views. Try this when the game is running or you see the setup wizard. IMPORTANT: If you happen to be using the same (compact) IOgear wireless keyboard that I'm using, you might notice that there is no NumLock key (or keypad for that matter)! 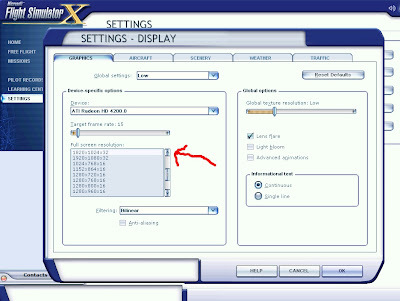 This creates a problem as you can't make the overlay screen go away without pressing these keys. If you have an extra wired keyboard handy, you can plug it in to get around this problem. Unfortunately, I didn't find any options in the IZ3D driver that allowed me to remap these keys. Serious gamers would probably want a different keyboard and mouse for playing games anyway. Of course your TV must be in 3-D mode as described in my earlier post on playing 3-D videos. However, you may also need to make sure that your Media PC is outputting a resolution that is compatible with 3-D. In my case, my TV will only support 3-D at the 1080p resolution. 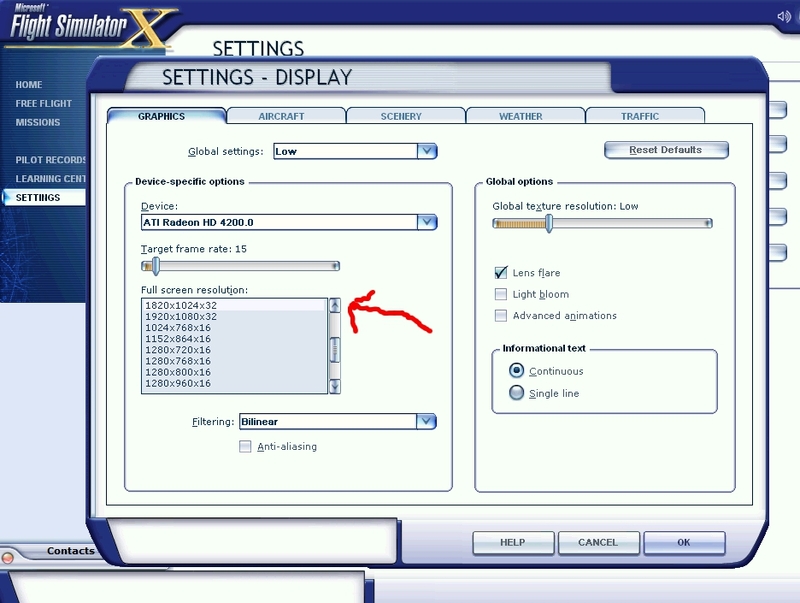 This means I must select either 1920x1080 or 1820 x 1024. I use the latter custom resolution to get around my TV's overscan (the TV will still see a 1080p signal for either resolution). Now, on to some games! Who could resist flying a virtual plane in 3-D? Microsoft has always had a good flight simulator and the latest demo works in 3-D! The demo is a little quirky, but all I needed to do was make sure that I selected the correct resolution as I mentioned earlier. In this case I used 1820x1024x32 to get a full screen view. I also dialed down the graphics a bit too. Of course, I didn't read the directions, I just jumped into some fun missions. The first one is dropping flour bags on targets in the ocean. As shown below, the IZ3D wizard comes up and you can use the NumLock and "*" keys to toggle 3-D mode. All I can say is Wow! The 3-D effect is really cool. 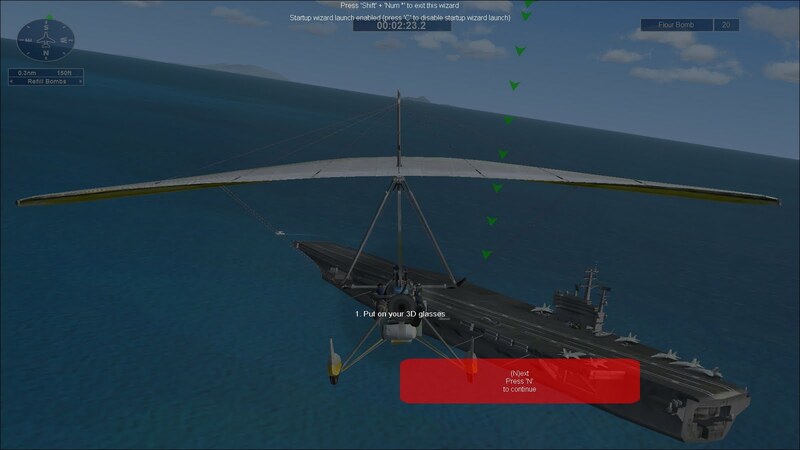 Right away I wish I had a better graphics card because the plane is very hard to control. However, I still had fun flying around the nearby island, mountains and buildings. I really liked the 3-D view from inside the plane. The instruments looked so much better in 3-D with a realistic view out the windows. Very nice! So, the flight simulator was fun, but I wasn't able to get the controls to work very well. I guess my HD 4200 just isn't up to the task. I thought I'd try a real game next. Half-Life 2 is probably one of the most popular and highly rated games out there (so I've heard). As before I started up the demo and set the screen resolution to 1820x1024 and dialed down as much of the "eye candy" (graphics detail) as I could to give it a chance to run. Surprise! Not only was the game very playable without lag, but the 3-D effect was nicely done! Here was a 3-D world in which you could explore and have fun (if you like this sort of game). You will want a better keyboard / mouse solution as using a trackball for a first person shooter is a real challenge to say the least! Well worth checking out! and very playable! 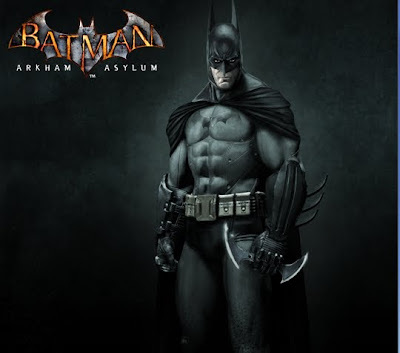 Batman is another highly rated game. The short video clip that plays before the level begins isn't in 3-D so I started to loose hope. However once the play started, I got 3-D enabled! I couldn't find any controls to lower the graphics detail, so the play was extremely laggy. It is no where near as playable as Half-Life 2 demo on my HD 4200. However, it worked and the the 3-D effect was good! Chalk up another reason to upgrade the graphics card! I also downloaded a bunch of other demos from Steam including Mafia II, Just Cause II, Bioshock, and Company of Heroes. All of them either crashed or didn't work and I'm not entirely sure why. 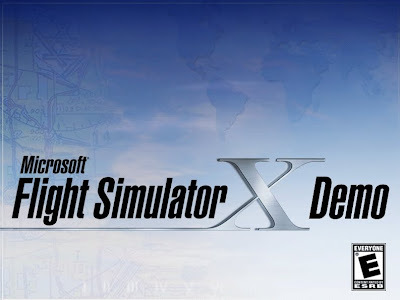 It could be that the demos are buggy or perhaps it's just asking too much of the HD 4200 to even launch the game! You might get lucky (like with Half-Life 2), but for gaming you should skip the embedded graphics and get a reasonably powerful discrete graphics card. I also tried Google maps (it has a 3-D mode, but sadly it is Anaglyph only). I tried Google Earth too, but couldn't find any support for 3-D at all. Perhaps I can get it to work with the DDD software. Finally, I noticed an unrelated problem with Netflix in Windows Media Center. Every time I exited a movie, WMC would seem to crash/hang. I could kill it with the task manager, so it wasn't too painful (just annoying). Once I unloaded the IZ3D drivers, the problem went away. I'm still debugging this so I'll report back if I find a fix. All-in-all, 3-D gaming is pretty cool and worth checking out!